The woven lily style that is pictured below can be woven for you in the size and colors of your choice. Tina always has some woven flowers available for immediate sale. Please contact Tina directly to make a purchase or commission a custom-woven lily. 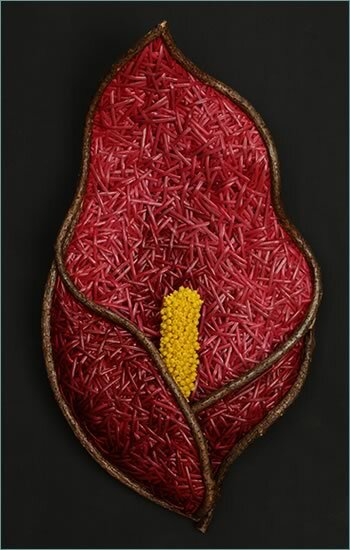 The curve of the bittersweet vine gives shape to the petal of this very elegant and 3-dimensional calla lily wall sculpture. Tina has woven the flower in several different shades of pink reed to create a very textured looking petal. This technique of weaving the reeds layer upon layer Tina developed herself and calls "Dimensional Weaving." The lily's pistil is woven in with reeds and beads. Pink Calla Lilly has been donated by Tina to the Lupus Foundation of America, DC/MD/VA Chapter, for their upcoming event Purple Passion Gala on November 21, 2015.